Cellulose acetate tapes and sheets provide a quick and convenient way for replicating surfaces particularly from samples which can not be sectioned or investigated directly. The replication materials are available in a variety of sizes and thickness to cover a wide range of applications. They soften in acetone and can be applied to a surface which has been wet with acetone. They are stripped off when dry. Thicknesses of 22 is used for finer detail replication. Tri-acetate, a thicker (130µm) replicating sheet, is suitable for replicating rough surfaces. For fine detail, positive replicas can be made by coating the surface of the replica with carbon in a high vacuum carbon coater and then dissolving the replication sheet. The carbon replica can then be examined in the TEM. Alternatively, the replica can be coated with a conductive coating (such as gold) and examined in the SEM as a negative replica. 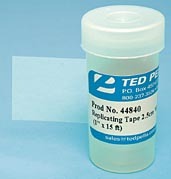 The replication tapes are packed as rolls in a dispenser and the sheets are supplied in packs of 20.